The PULSE 80 aquarium has a capacity of 80 liters. It is manufactured by Cubic Aquarium Systems. 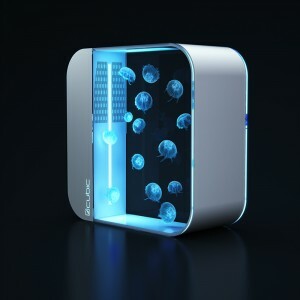 Jellyfish Concept is exclusive distributor of CUBIC products in France. After two years of testing, it has been specially designed to keep several species of jellyfish. Jellyfish Concept offers a complete package with the aquarium. It is sold with filter media, for better efficiency, you can add an external filtration. This pack also includes Jellyfish Concept salt and bacteria (for impoundment and the start of the aquarium). The recommended sea water changes of 30% every 3 to 4 weeks, but do not hesitate to renew more frequently if necessary, depending on the results of your water tests. – 1 mixing pump 1200 L / h at adjustable speed. – 2 filter sponges (removable and pre-installed). – 1 band 10 W LED color changing (removable and pre-installed). – 1 remote control to manage the variations of light (requires 2 AAA 1.5V – not included). – 2 adapters to connect any other filtration module. This aquarium can accommodate up to 15 jellyfish. For larger quantities, it is necessary to add an external filter.